We scan everything ourselves- right here in the USA! We pride ourselves in our track record since we started the business back in 1995. We have always made sure that each and every one of our customers is treated with professionalism along with a personal touch. We're proud to be the most trusted source for slide and negative scanning in North America. 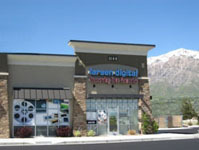 We are located Pleasant View, Utah, which is 45 miles north of Salt Lake City, host of the 2002 Winter Olympics. Brent Larsen has always been an avid lover of photography. Starting as a child, you could always find a camera in his hands. Over the years, his love of computers and technology also grew. In the early 1990's Brent knew that his vast 35mm slide collection was starting to degrade. He knew that he wanted to save them digitally, but the technology wasn't readily available. So he invested in his first scanner, with a promise to his wife that he would earn money back by scanning the neighbor's slides himself. What he found was an enormous need from family, friends, and strangers who also knew the value of scanning & converting their film to digital. Larsen Digital started out as an "internet only" business and was run out of his basement for the first few years. Then, in 2006 he took the giant leap and opened his location that was open to the public. Some of our competitors outsource the scanning to India or other countries. An estimated 10,000 shipping containers are lost at sea each year. One size does not fit all. We offer various scanning resolutions to fit anyone's needs.